Those of you who read this blog or visit the projects website regularly will know that October 2009 is an important time for The Crystal Earthworks as during this month the physical base for the project moves from the Glaisdale, Whitby area of North Yorkshire, England to Harray on the West mainland of Orkney, Scotland. As the second Crystal Earth meditation for October falls into our moving period this posting is for both events. This meditation will use a Pure Peace Set, and celestite. 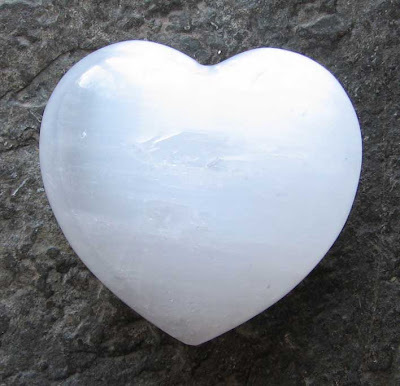 Please use the image below of a Pure Grace Heart, the central crystal for these meditations, as a positive focus. For further information regarding Pure Peace Sets please visit the blog posting 22nd March 2008 and 2009. Thank for your connection. 'To send peace, healing and angelic connection to the lands and peoples of South east Asia and the Southern Pacific'. The crystals used will be a Pure Grace Heart, Rose Quartz and Celestite. Please use the image below as a positive focus. Thank you for your support of those in great need.